The Southeastern Gond live in the forests and hills of southern India. They are primarily concentrated in the state of Andhra Pradesh, south of the Godavari River and in adjoining districts north of the river. Although they are a subgroup of the Maria Gond, their language and customs were strongly influenced by the Telugu, their former rulers and present neighbors. Today, many of the Gond are bilingual, speaking both their native language, Koi Gondi, and the Telugu language. They generally refer to themselves as Koi or Koya, which means mountain people. Historically, the Gond were the most important group of original Indian tribes. In the 1500s, several Gond dynasties were established and the Gond rajas, or kings, ruled like Hindu princes until they were conquered by Muslim armies in 1592. In the 1700s, the Gond lost all power to the Maratha kings, who forced them to flee into the hills. Traditionally, the Gond were semi-nomadic farmers, who used the slash and burn method of agriculture. After farming an area for two or three years they would abandon their houses, move to a different location, and make new land clearings. Most of the Gond farmers have now been forced by the government to change their methods of farming in order to preserve the forests. As a result, there are more permanent Gond villages. Many of the farmers have prospered, acquiring a higher social standing due to their change to plow cultivation. Unfortunately, some of the families have struggled with this change in culture, going into debt to purchase bulls for tilling. All of the Gond survive by farming, hunting, and eating the fruits of the forests. The local markets provide a place where they can trade their goods, as well as communicate with other ethnic groups. The Southeastern Gond do not make their own clothes or jewelry, but purchase them from neighboring groups. Gond villages are intended to be communal, territorial units. The tribe is headed by a chief, and each village is led by a committee of elders. The chief serves as the judge of all tribal disputes, while the elders have legal authority over their villages. Unfortunately, their great poverty and lack of education have left the Gond politically powerless. Gond society is basically patriarchal (male-dominated) and patrilineal (line of descent is traced through the males). The tribe is divided into clans, each of which represents the descendants of a common male ancestor. The Gond are exogamous, which means that they do not marry within their own clans. Cross-cousin marriages are preferred and polygamy (having multiple spouses) is not discouraged. A strong bond exists between all members of the tribe. Though individuals are personally free, they are bound to defend each other's freedom. Liberty, equality, and brotherhood are the main principles of the tribe. Most of the Gond are Hindus, worshiping millions of gods and goddesses. Some are animists (believe that non-living objects have spirits). They are convinced that the forest is the dwelling place of the gods and ancestral spirits. The most important gods and goddesses are enshrined under trees and represented by flat stones. The villagers pray to the ancestral spirits for protection and blessings. Although the Gond do not believe in the immortality of the soul, they do believe in reincarnation-one soul may pass to another body after death. The Southeastern Gond believe in a supreme god named Deur. They believe that he resides high above the sky and that he created everything. While they have no concept of his form, they believe that he may appear in dreams as a human. The Jesus film and the New Testament are available in the Koi Gondi language. However, there are only a few known Gond believers. Prayer is the key to seeing them reached with the Gospel. * Ask the Lord to call people who are willing to go to Andhra Pradesh and share Christ with the Gond. * Pray that present outreaches by missions agencies may increase despite opposition. 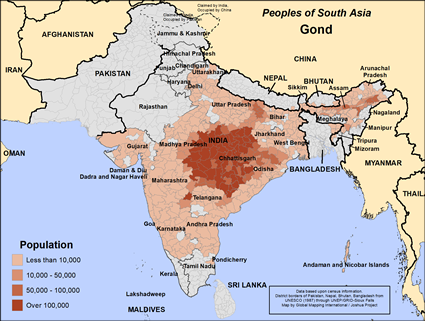 * Ask God to encourage and protect the small number of Gond Christians. * Ask the Holy Spirit to soften the hearts of the Gond so that they will be receptive to the Gospel. * Pray that God will save key Gond leaders who will boldly declare the Gospel to their own people.View Gond in all countries.